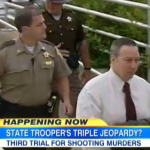 Dan appeared on Good Morning America today alongside Nancy Grace to discuss the murder trial of David Camm, the former Indiana state trooper on trial for the third time for killing his wife and two kids. Camm, 49, is charged with shooting his wife, their 7-year-old son and 5-year-old daughter to death in their car in 2000, though he has consistently denied the allegations, appealing convictions in 2002 and 2006. Those were overturned on the grounds that the court allowed inadmissible evidence. Dan explains, “In the first case, the court says that they improperly admitted all these other affairs. In the second case, they say that they improperly admitted allegations that he molested his daughter. The problem for prosecutors now is A) that they’ve got a motive problem, which is, you don’t have to prove motive but it certainly helps and the question for this jury may be ‘why?’, but B) and to me this is a more important issue, you’ve got another guy who’s been convicted, whose DNA is found at the crime scene – he wasn’t a family member so his DNA shouldn’t be there; I think that’s going to be very powerful for the defense.” Nancy, of course, disagrees with Dan and doesn’t see the same obstacles – see her segment here.